Behind on federal student loan payments? Student loan rehabilitation can re-age your account payment history to show “current on payments”. You can easily wipe-away those late payment marks. Are your wages getting garnished due to delinquent student loan debt? A student loan rehabilitation program will also stop wage garnishment. If you fell behind on student loan payments, student loan rehabilitation is your best solution. 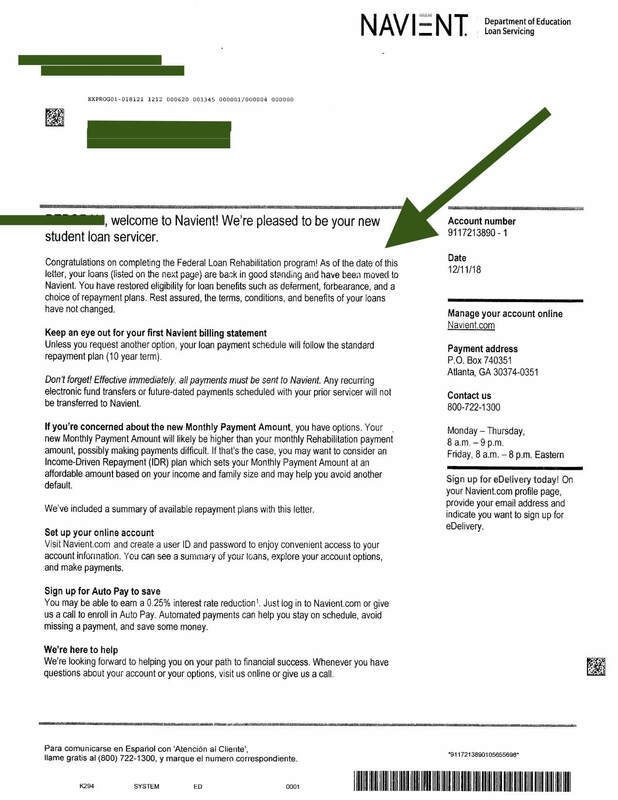 In the letter above, the student graduated a loan rehabilitation program and their creditor is agreeing to remove the default status and restore their federal benefits. Federal benefits include: debt consolidation, forbearance, income-driven repayment plans, loan forgiveness and many more. What if my wages were already garnished, will loan rehabilitation help? You won’t qualify for a debt relief program. You are no longer eligible for the government debt repayment plans. Not even bankruptcy can stop your wage garnishment. Student loan rehabilitation is your only option left. However, this is nothing to cry about. Loan rehabilitation offers you an opportunity to get a fresh start. The plans are affordable and quick to complete. You can complete a loan rehabilitation program within 5-9 months. Immediately after completing it – the wage garnishment STOPS! The default payment status gets removed from credit reports. Payment status gets refreshed to show “current on monthly payments”. Eligibility to apply for forbearance and student loan consolidation gets restored. Eligibility to apply for an income-driven repayment plan gets restored. Eligibility to apply for student loan forgiveness gets restored. What will loan rehabilitation do for me? Loan rehabilitation will repair your credit, getting the past-due payment notations removed from your credit report and re-aging the payment status to show “current”. You’ll be given your federal benefits back. Who offers a student loan rehabilitation program? Every student loan lender and debt collector offers student loan default rehabilitation. Navient, Great Lakes and Sallie Mae all offer loan rehabilitation programs. If your accounts are with a third-party collection agency they will also offer it to you. How to get on a loan rehabilitation program? Simply contact your student loan lender. They will transfer you to the correct department. You can do almost everything over the phone. They will ask you a series of questions, but the most important questions will pertain to your gross income and family size. How is your monthly payment determined on a student loan rehabilitation program? Student loan creditors use the same calculation used in the income-based repayment plans offered through the federal government at StudentLoans.Gov to also calculate the rehabilitation payment. The student loan rehabilitation program monthly payment will be based on your family size and gross income. Look at your income for the last three months. Is there a particular month that shows a lower amount? Use that lowest month’s worth of income to calculate your annual adjusted gross income. Give the student loan lender that amount over the phone. They will then require you to send that month’s worth of paystubs, which you can then easily do! Any other questions? Tell us in the comments section below. If you have over $15,000 in credit card debt, student loans and unsecured debt, talk to an IAPDA certified debt counselor at 866-376-9846 for free. The following information has been provided by Paul J Paquin, Golden Financial’s CEO and President. Golden Financial Services is a California based debt relief company, offering plans in almost all 50 states. To find out if your state has debt relief options simply click here and select the state you live in. Golden Financial also started offering debt settlement in Arkansas and Arizona debt relief programs as of 2019. Want to find out if you qualify for Golden Financial’s debt relief programs? Give this national debt payoff calculator a quick try. You may also be interested in this next post on the 10 best ways to clear high credit card debt in 2019.